The Poznan company Profitroom has just won an international content once again! Bungalow.hr has taken the first place in the category Travel/Tourism/Nature Website of the contest Summit Creative Awards over 5000 other websites from all around the world. The winner website has been executed for a unique complex of luxurious mobile bungalows located on the sunny coast of Croatia. How did we succeed in achieving the final result of such a splendid form? The challenge was a big one, indeed, since the place was supposed to be depicted as a holiday destination full of attractions throughout the year, and the bungalows were to be perceived as a comfortable idea to spend your vacation. Additionally, the page had to fulfil the highest standards of website design, that is, to adapt itself perfectly to mobile devices and use solutions for the highest sale possible. How the did team approach the task? “To be honest, the project of bungalow.hr did constitute a considerably interesting challenge for us. What we aimed for was presenting Croatia as a place where the sun never fades way and a cosy relaxation seems to last forever. The picturesque landscape of the Adriatic coast brought a wave of inspiration for our website, making it sunny and so holiday-like. Having such a splendid background as a support, we could present the offer of luxurious mobile bungalows with a claw. Brand new technologies and a user-friendly interface make the website burst with positive energy right from the start.” - says Małgorzata Krajewska, Senior Project Manager in Profitroom. As a result, we have accomplished a website which is not only visually attractive but also enormously effective. It presents the luxurious mobile bungalows in Croatia in a transparent and comprehensible way. The experts from Profitroom point out that one should pay particular attention to presenting the offer key factors in such a way which attracts attention. Our key to the success here were such factors as: an interesting exposition of photos, smooth and adjusted animations as well as a modern design, enriched with extra tools which boost the sales even more. And due to the brand new technologies used, the final result is not only user-friendly, but also very functional, which is often praised by the Guests. The project quality has been appreciated by the jury of Summit Creative Awards and awarded with the first place in the category Travel/Tourism/Nature Website. Bear in mind that as many as 5000 websites from 21 countries took part in the contest, therefore, the triumph is a great one, indeed. “Winning the first place in such a prestigious contest does make us immensely proud and it will certainly be an incentive to work even harder at the new realizations to come. By winning this award, we have proven that also on the international forum we still can achieve great results and the quality of our service can be honoured in a contest for the best interactive agencies from the whole world." - adds Małgorzata Krajewska. Don’t hesitate to visit the prizewinning website and read the detailed article by Profitroom about this project. For 22 years now the organization called Summit International Awards has been granting awards for excellence in creativity and effectiveness of advertising and communication content. 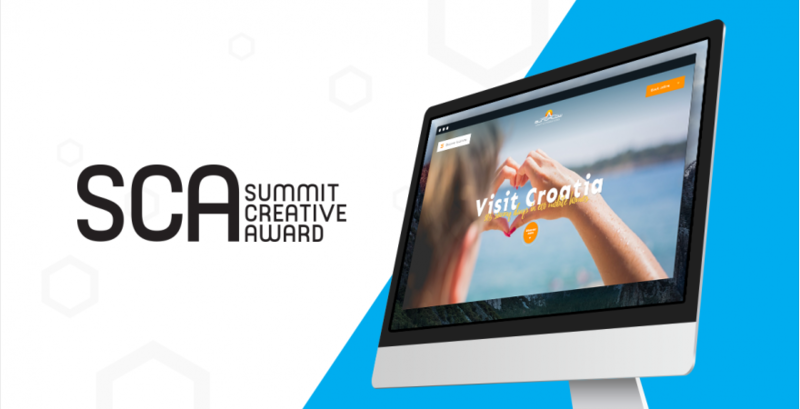 One of the contests organized by them is the Summit Creative Awards, which aims at distinguishing the most creative website projects submitted by interactive agencies from the whole world. Approximately 5000 websites from 21 countries took part in the Summit Creative Awards 2016. They were analysed by a jury of experts from such organizations as: Central Washington University, ANNODYNE, Balmoral Marketing, BANG! creative communications, Barrett and Welsh. The award ceremony is always held in Portland, United States. Profitroom has been for 10 years now related to the hospitality industry and at present, thanks to its specialists both here in Poland and abroad, it works for more than 1300 hotels from the whole of the world. It is the greatest Polish provider of online booking systems, well-known for the Upper Booking Engine; designing hotel websites and providing marketing services to hotels as well. In the recent years Profitroom was repeatedly distinguished for its projects taking part in international contests and thereby constitutes a reliable, respected and valued business partner for hoteliers. Thus, not without a reason the company has gained the trust of the most respected independent hotel brands, apartments and the best marketing associations and groups. If you’d like to find out more about it, don’t forget to visit our website.